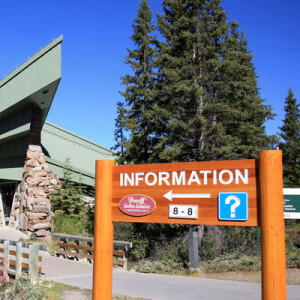 Each of the five national parks has at least one park information center. These are the places to head for interpretive displays, all park-related information, trail reports, weather forecasts, and wilderness passes. Individual addresses and websites are listed in the relevant travel chapters. The national parks are managed by Parks Canada (www.pc.gc.ca). On the Alberta side of the Canadian Rockies, all other parks are managed by Tourism, Parks, and Recreation (www.albertaparks.ca). British Columbia’s provincial parks are managed by BC Parks (www.bcparks.ca). Begin planning your trip by contacting the government tourist offices of Alberta and British Columbia: Travel Alberta (780/427-4321 or 800/252-3782, www.travelalberta.com) and Tourism British Columbia (250/387-1642 or 800/435-5622, www.hellobc.com). Both will fill your mailbox with useful literature and maps, which can be ordered by phone or through their respective websites. In Calgary, you’ll find an information booth on the arrivals level of the airport. The Vancouver Visitor Centre (604/683-2000) is at 200 Burrard Street, although information on the Canadian Rockies is limited. Each town in the Canadian Rockies has a visitor centre, and most have a local tourism authority. For information on these specific destinations through the Canadian Rockies, click through the links on the right side of this page. Unless you’re passing directly through, passes are required for entry into all five national parks covered in this book (entry to Kananaskis Country is free). Monies collected from these passes go directly to Parks Canada for park maintenance and improvements. A National Parks Day Pass is adult $9.80, senior $8.30, child $4.90, to a maximum of $20 per vehicle. It is interchangeable among parks and is valid until 4 p.m. the day following its purchase. An annual Parks Canada Discovery Pass, good for entry into all of Canada’s national parks and national historic sites for one year from the date of purchase, is adult $67.70, senior $57.90, child $33.30, to a maximum of $136.40 per vehicle. Both types of pass can be purchased at park gates (at the entrance to Banff, Kootenay, Jasper, and Waterton Lakes National Parks), at the tollbooths at either end of the Icefields Parkway, at all park information centers, and at campground fee stations. They can also be purchased online through the Parks Canada website (www.pc.gc.ca). In 2017, admission will be free to all Canadian national parks. All prices quoted on this website are in Canadian dollars and cents unless otherwise noted. Canadian currency is based on dollars and cents, with 100 cents equal to one dollar. Coins come in denominations of 1, 5, 10, and 25 cents, and one and two dollars. The 11-sided, gold-colored, one-dollar coin is known as a “loonie” for the bird featured on it. The unique two-dollar coin is silver with a gold-colored insert. The most common notes are $5, $10, $20, and $50. A $100 bill does exist but is uncommon. Visa and MasterCard credit and debit cards are also readily accepted in the Canadian Rockies; American Express charge cards are less widely accepted. By using these cards you eliminate the necessity of thinking about the exchange rate–the transaction and rate of exchange on the day of the transaction will automatically be reflected in the bill from your credit-card company. On the downside, you’ll always get a better exchange rate when dealing directly with a bank. It’s also handy to carry small amounts of Canadian cash. Banks offer the best exchange rates, but other foreign-currency exchange outlets are available. The cost of living in the Canadian Rockies is generally higher than in other parts of Canada, especially when it comes to accommodations. Provincially, the cost of living is lower in Alberta than in British Columbia but higher than in the United States. By planning ahead, having a tent or joining Hostelling International, and being prepared to cook your own meals, it is possible to get by on $80 per person per day. Gasoline is sold in liters (3.78 liters equals one U.S. gallon) and as of 2016 is $0.90 to $1.20 per liter for regular unleaded, rising to $1.40 along the Icefields Parkway. Tipping charges are not usually added to your bill. You are expected to add a tip of 15 percent to the total amount for waiters and waitresses, barbers and hairdressers, taxi drivers, and other such service providers. Bellhops, doormen, and porters generally receive $1 per item of baggage. Canada imposes a 5 percent goods and services tax (GST) on most consumer purchases. The British Columbia government imposes its own 7 percent tax (PST) onto everything except groceries and books. Alberta has no provincial tax. So when you are looking at the price of anything, remember that the final cost you pay will include an additional 5 to 12 percent in taxes. To enter Canada, a passport is required by citizens and permanent residents of the United States. At press time, the U.S. government was developing alternatives to the traditional passport. For further information, see the website travel.state.gov/travel. For current entry requirements to Canada, check the Citizenship and Immigration Canada website (www.cic.gc.ca). All other foreign visitors must have a valid passport and may need a visa or visitors permit depending on their country of residence and the vagaries of international politics. At present, visas are not required for citizens of the United States, British Commonwealth, or Western Europe. The standard entry permit is for six months, and you may be asked to show onward tickets or proof of sufficient funds to last you through your intended stay. No vaccinations are necessary for visiting Canada. Canada Post (www.canadapost.ca) issues postage stamps that must be used on all mail posted in Canada. First-class letters and postcards sent within Canada are $1, to the United States $1.20, to foreign destinations $2.50. Prices increase along with the weight of the mailing. You can buy stamps at post offices, automatic vending machines, most hotel lobbies, the airports, many retail outlets, and some newsstands. Alberta and British Columbia have three and four area codes respectively. The area code for southern Alberta, including Banff and Canmore, is 403. The area code for northern Alberta, including Jasper National Park, is 780. 587 is a newer area code for all of the province. The area code for all of British Columbia except Vancouver and environs is 250. The area code for Vancouver is 604. The area codes 778 and 236 overlay the entire province. Unless otherwise noted, all numbers must be dialed with this prefix, including local calls made from within Alberta. The country code for Canada is 1, the same as the United States. Public phones accept 5-, 10-, and 25-cent coins. Local calls cost $0.35, and most long-distance calls from public phones cost at least $2 for the first minute. Phone cards, available from drug and grocery stores, provide considerable savings for those using public phones. Most Internet providers allow you to access your email away from your home computer, or open an email account with Hotmail (www.hotmail.com) or Yahoo (www.yahoo.com). Although there are restrictions to the size and number of emails you can store, these services are handy and, best of all, free. Public Internet access is available throughout the Canadian Rockies. Most lodgings have Wi-Fi or high-speed access from guest rooms (the exception are lodges in remote locations). Except for wilderness hostels, backpacker lodges provide inexpensive Internet access. You’ll also find wireless Internet access at cafes in Banff, Canmore, and Jasper. Canada officially adopted the metric system back in 1975, though you still hear grocers talking in ounces and pounds, golfers talking in yards, and sailors talking in nautical miles. Metric is the primary unit used in this book, but we’ve added imperial conversions for readers from the United States, Liberia, and Myanmar, the only three countries that have not adopted the metric system. You can also refer to the metric conversion chart in the back of this book. Alberta is in the mountain time zone, one hour later than Pacific standard time, two hours earlier than eastern standard time. The mountain time zone extends west into southern British Columbia, which includes Yoho and Kootenay National Parks as well as the towns of Golden and Radium Hot Springs. The rest of British Columbia, including Mount Robson Provincial Park, is in the Pacific time zone. Daylight saving time is in effect from the second Sunday of March to the first Sunday in November. This corresponds with the United States (except Arizona) and all other Canadian provinces (except Saskatchewan).